After your home, your vehicle is probably the most expensive investment you have. Here in Southern California, the sun beats down on your car and your home every day, causing increased heating to your interior, fading of your fabrics on seats and dashboards or in your home on your furniture and hastening the premature aging of your most prized possessions. You can drastically reduce the effects of the sun with a professional window tinting or specialty films installation by JRP Services. Regardless of architectural design, window tinting installed on commercial buildings are the most cost-effective way to rejuvenate a properties exterior appearance. Window tinting comes in a variety of shades, colors and performance are available for your windows and can easily be coordinated with a properties interior or exterior for a more contemporary look. Ask us about JRP Services Armor Coating window tint, a tough - resilient safety and security film Armor Coat provides an effective and non-obtrusive defense against intruders, accidents, explosions, and weather - helping to save lives and protect your property. 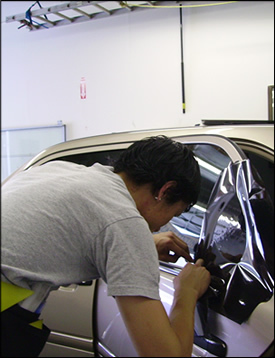 Our Graffiti guard window film will protect your glass, mirrors and most surfaces from Vandalism. For your, Window tinting, graffiti guard, safety film and designer window tint. please call us for a consultation and a free estimate.